Skye Gravestones | Kilmore Burial Ground, Sleat. The burial ground at Kilmore lies next to the main road between Broadford and Armadale (park in lay-by about 200m to the east). This is a long-established sacred site, associated with Columba, and with the Lords MacDonald. The ruins are of a 17thC church, possibly the second one on the site, which remained in use till 1874. The existing church opened in 1876. There are three distinct burial areas. 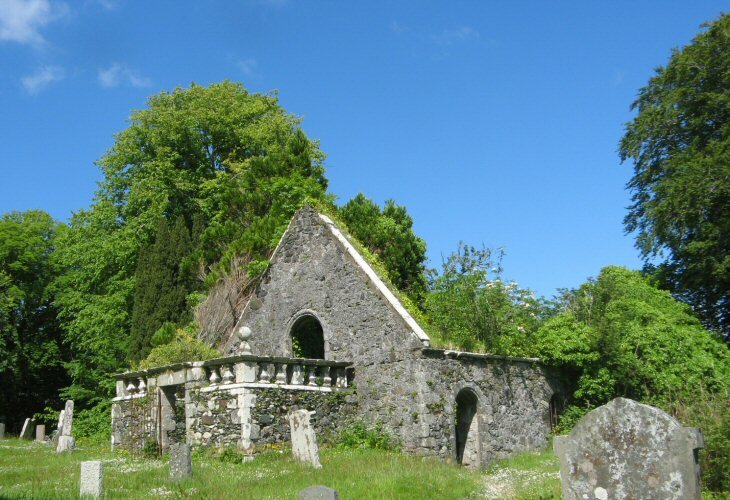 The upper, old part, next to the existing and ruined churches,is called 'Kilmore' on this website. There are two sections at lower level, one towards the sea, 'Kilmore Extension 1', and, the other towards the road, 'Kilmore Extension 2' (the latter has two pre-1980 death transcriptions). Along with Macdonald, the predominant names on headstones in the old part are MacInnes and Robertson. Despite the site's antiquity, there are very few stones with dates earlier than 19th C. No doubt there are many stones, inscribed or blank lying beneath the turf. I am desperate to find the grave site or any info on Donald Cameron Innkeeper at Kylerhea, he died 1873 and was 52 years of age. Had one daughter Jessie, sons Malcolm, Ewen, Samuel, John and Martin. His wife was Called Janet nee Martin. We are visiting the Isle Of Skye 6-9th August. ANY info would be so appreciated.